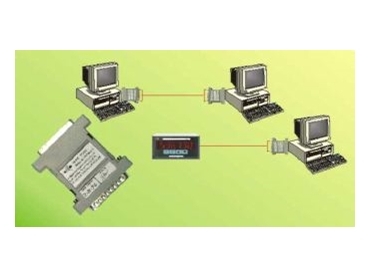 SOME limitations of RS232 serial data transmission are the maximum transmission distance of approximately 15m and the fact that it is single ‘point-to-point’. A way to overcome these limitations is to use RS485 communications and Amalgamated Instrument Co (AIC) has made it very easy with its PC485 and PC422 serial converters. These neat little devices plug into an existing serial connector in IBM PC compatible PCs and convert the RS232 protocol to RS485 (in the case of the PC485) or a choice of RS485 or RS422 (in the case of the PC422). The adapters are about the size of two standard D shell 25 pin plugs and fit neatly out of sight. With the RS485 communications, transmission distances of up to 1200 metres and multipoint communication is possible. Many devices can be connected in a ‘daisy-chain’ fashion. Each device is assigned an address and the PCs can interrogate each of them. The converters were originally designed to allow the downloading of data from multiple AIC instruments but the PC485 and PC422 have proved very effective in many applications where more flexible communications is required. AIC also manufactures mains powered and DIN rail mounted RS232 to RS485/RS422 converters. Amalgamated Instrument Co 02 9476 2244.